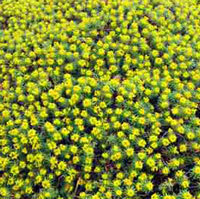 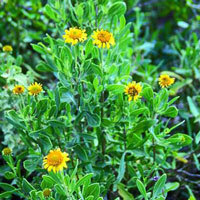 Bushy Rest-Harrow: shrublet around 20-60cm high; the whole plant covered in sticky hairs; leaves divided into three leaflets each of which darkish green and tooth-edged; small yellow flowers with fine red veins hang in loose clusters; blooms in spring. 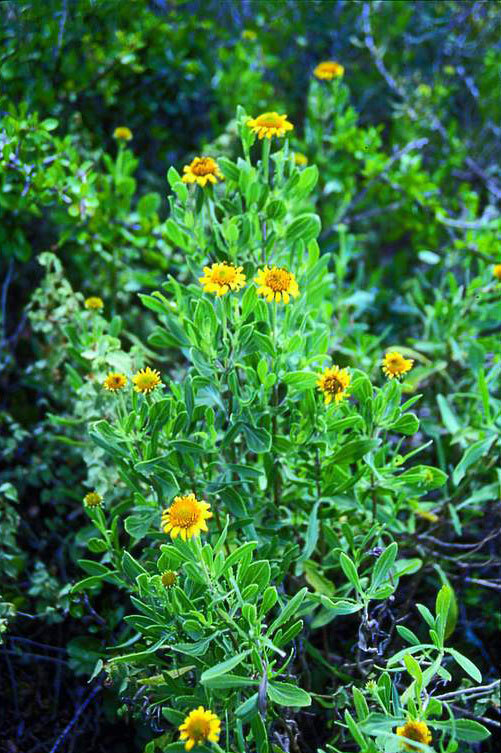 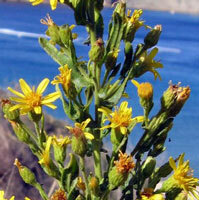 Maltese Fleabane: small shrub with a strong smell of camphor; leaves coated with fine white hairs in winter and spring; small yellow daisy-like flowers summer and autumn; grows on garigue and cliffs. 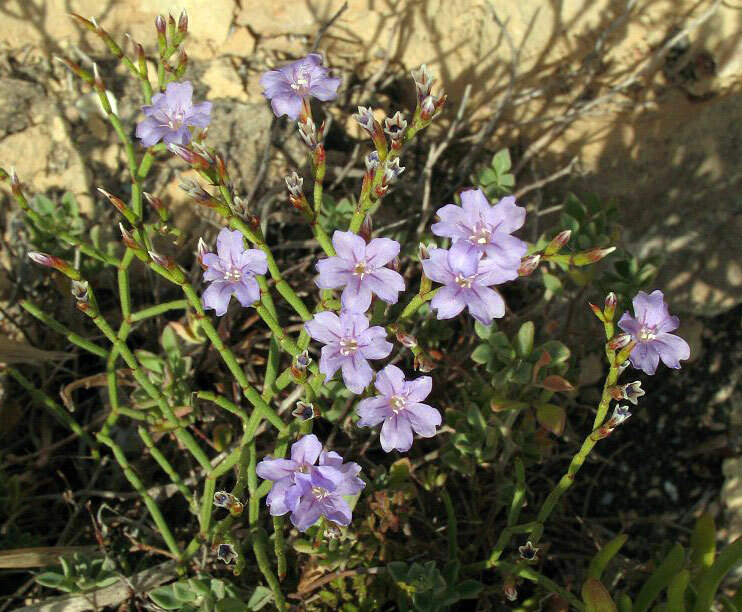 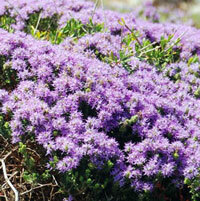 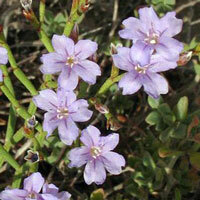 Maltese Sea Lavender: cliffs near sea; low shrub, rigid stems with regular acute angled branching presenting a zigzag outline appearance of the plant; pale violet flowers late summer. 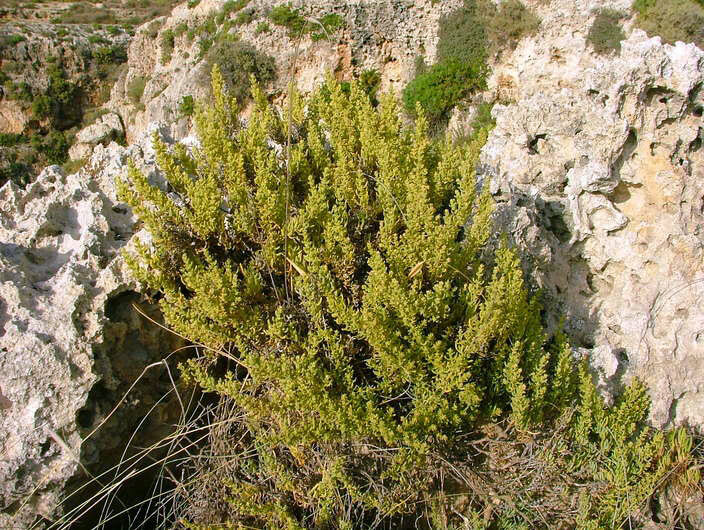 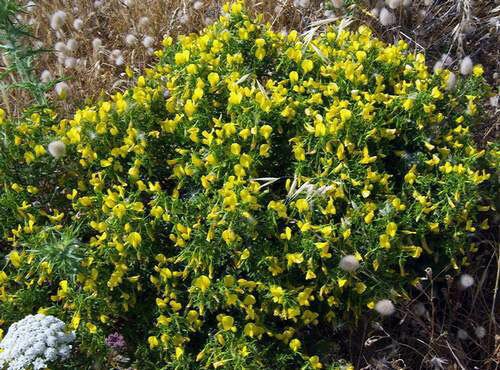 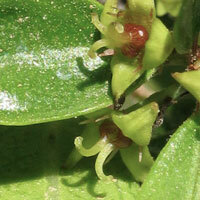 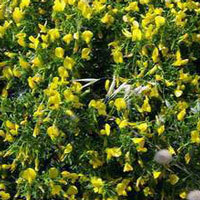 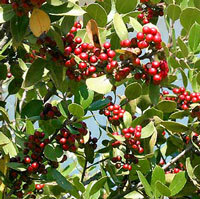 Maltese Salt Tree: dense shrub, 1-3m size, small yellowy-green leaves of fleshy appearance and cylindrical shape, forming rounded tips; flowers very small; single fruits with petal-like wings in autumn. 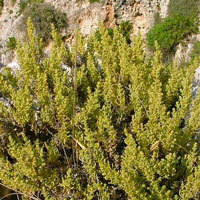 Maltese Spurge: low prevalent dense shrub on garigue, small deciduous leaves, yellow flower heads in spring. 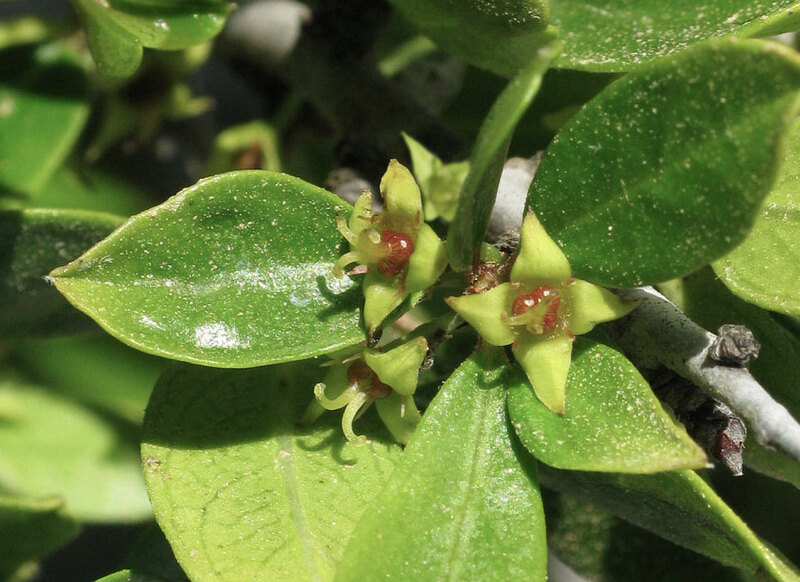 Tree Spurge: a dominant species in Comino garigue; large hemispherical shape, deciduous leaves - long narrow shape up to 10 cm long; leaves turn reddish before they are shed; yellow flower heads in spring. 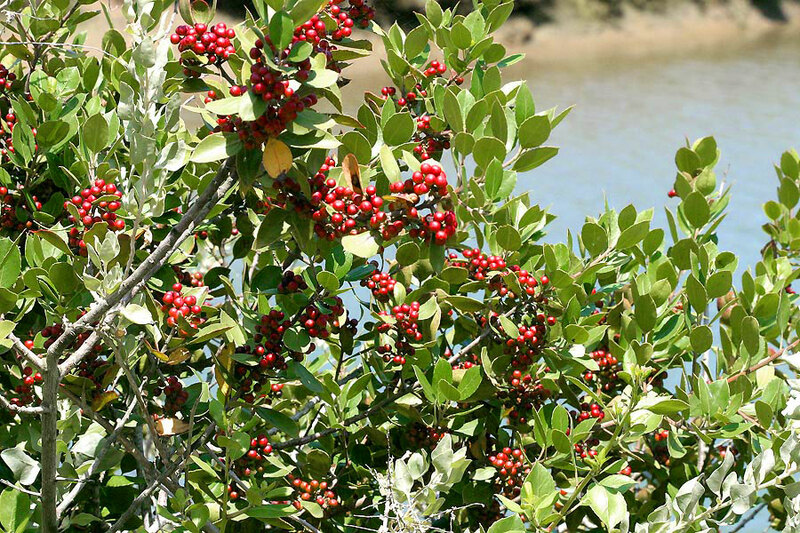 Mediterranean Buckthorn: thornless evergreen large shrub or small tree 2-5m high; reddish grey bark, leathery leaves with toothed edges, rounded or pointed tips and up to 6cm long and with pale green undersides; male and female flowers Feb-April; red small spherical fruits in clusters – at first red then black. 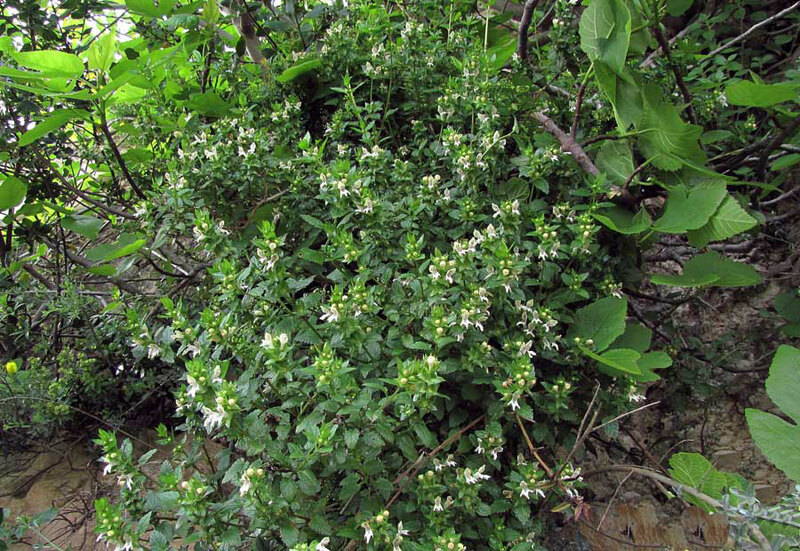 Olive-leaved Buckthorn: medium shrub with small smooth edged ellipse shaped leaves resembling those of wild olive; branches end in short sharp hard spine; flowers tiny in spring; fruit small and black. 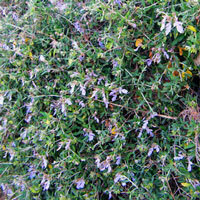 Mediterranean Heath: bush 50-100cm plus in height; leaves short, needle-like, dark green; flowers pale or deep pink in dense bunches of tiny bell shapes; blooms winter into spring; can be dominant shrub. 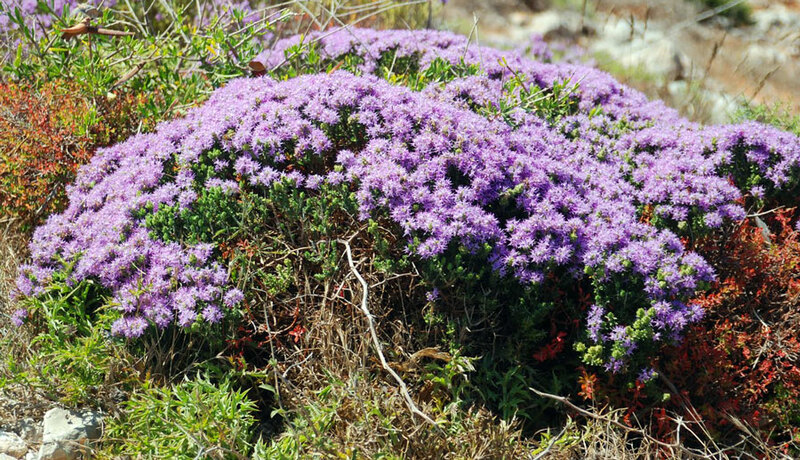 Mediterranean Thyme: low shrub, small highly aromatic crowded leaves; clustered small pink flowers in spring; often observe bare short woody stems between foliage. 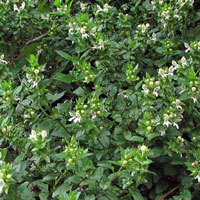 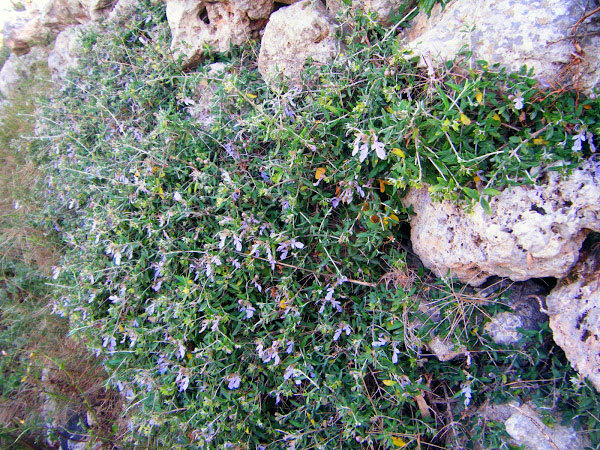 Olive-leaved Germander: dense shrub, 50-100cm or more; leaves dark green and elliptical shaped upper side and white felted underneath; flowers white to pale violet from winter to late spring; prevalent on Comino. 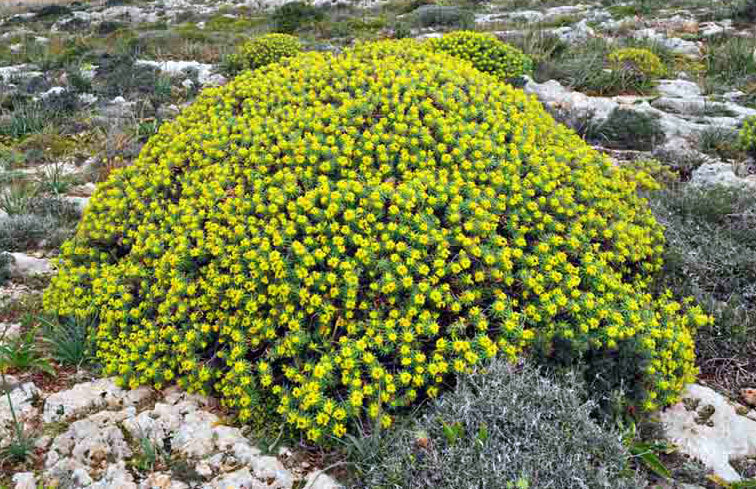 Seaside Ox-eye Daisy: aromatic herbaceous plant; deep yellow flowers with spiny bracts in spring and early summer; on rocky ground near the sea especially on Comino. 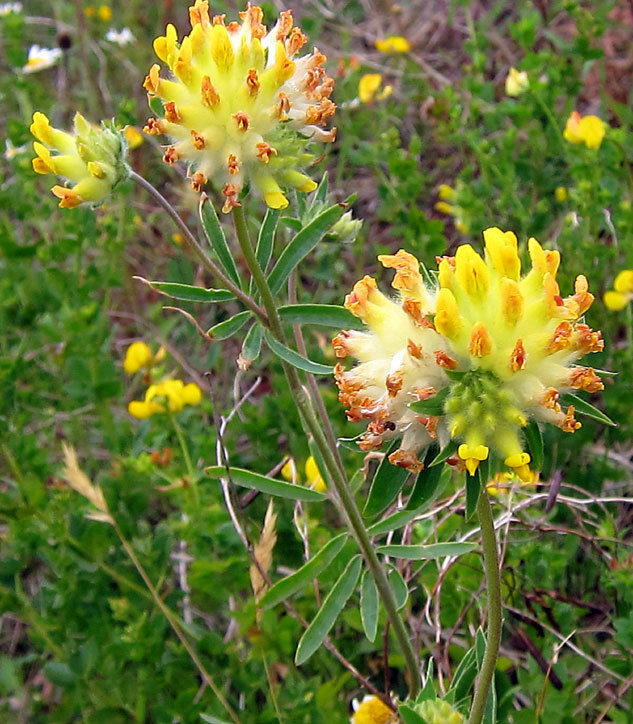 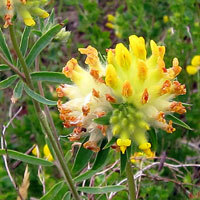 Shrubby Kidney Vetch: low shrub; thickly branched with white felted young stems; small leaves covered in silky hairs which divide into three thin upward folding leaflets; yellow flowers in groups of up to three in late spring-early summer. 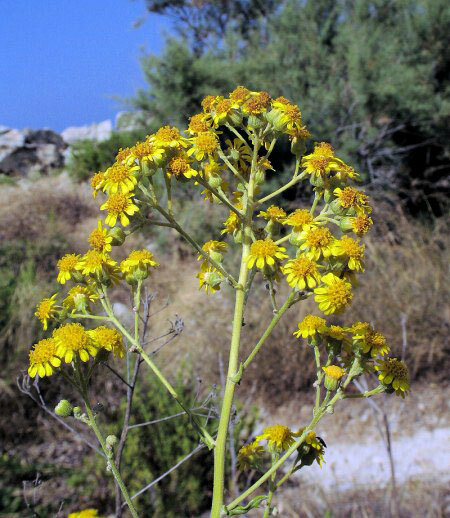 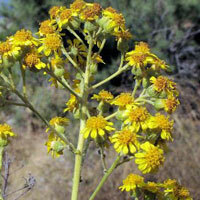 Silvery Ragwort: shrub up to 1m size; leaves dark green to grey upper side and silvery grey underside from dense coating of short hairs; flowers late spring to mid- summer with clusters of yellow flower heads on erect stems. 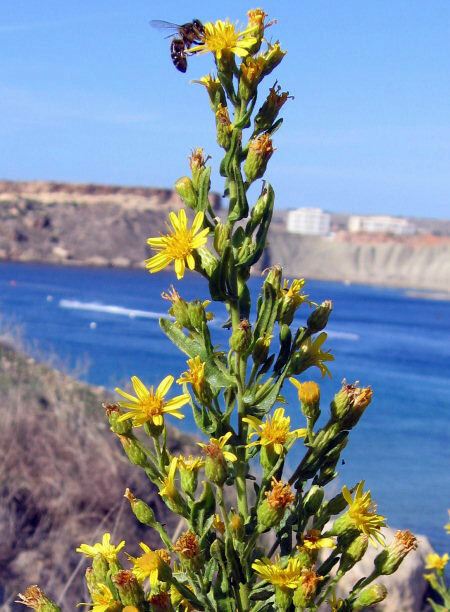 Other plants including trees to look out for on Comino include: African Tamarisk, Lentisk, Aleppo Pine, Chaste Tree, Carob, Giant Fennel, Wild Artichoke, Boar Thistle, Branched Asphodel, Sea Squill, Fat Hen, Sand Crocus, Yellow Wort, Blue Pimpernel, Blue Stone Crop, Horn-of-Plenty, Golden Samphire, Bellardia,Wolfbane and up to six kinds of orchids.